A temporary crown is a restoration that is made to be worn for one to two weeks at the most. Its job is to cover up a tooth that has been reshaped for the permanent crown, preventing sensitivity and keeping it right where it should be. The temporary is made out of plastic and will be shaped to match the dentition of the affected tooth as closely as possible. A temporary adhesive is used to keep it in place while the permanent crown is created in a separate lab. 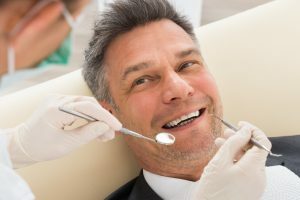 When you return to your dentist for the follow-up appointment, the temporary will be removed and the permanent crown will be securely affixed to the top of the prepared tooth. But that’s all if everything goes just right with the crown — of course, this is not always the case. A temporary crown may fall out before you can make it back to your dentist’s for the second visit. This is especially true for those on the molars and premolars, which incur more force from chewing. If a temporary comes loose or falls out completely and you still have some time before your next appointment, don’t panic. Follow these steps to avoid pain and keep your mouth safe. Remove the crown or broken piece. Rinse your mouth out to remove shards (if they are any). Look at the tooth if possible and run your tongue carefully over its edges. Is it smooth, or are you at-risk of cutting yourself on a jagged edge? This important information should be relayed to your dentist when you call. Call the dentist and describe the situation in full detail. Follow their instructions carefully. Return to the office as soon as is recommended for a replacement crown or to have the temporary one bonded back on. Take care with the new temporary until your permanent one is ready. Avoid chewing directly on the restoration and do not floss the area — this could yank on the temporary crown and cause it to come out prematurely yet again. To conclude, it’s not such a big deal if the temporary comes out before your second appointment for a dental crown. This restoration is made to only last a week or two, anyway. Just follow these tips and get in touch with your dentist right away for a solution! The team of experts at Dental Center of Jacksonville offer full-service dental care from the comfort of their modern dental practice. To discuss the process for dental crowns or to learn more about their other general, restorative, and cosmetic treatments, you are invited to contact your dentist in Jacksonville by calling 904-262-9466.